A miracle happened at Roanne, France. I looked people in the eye. I didn't cower when they spoke to me. I opened my mouth and French came out. Six months earlier I had been passing through, traveling with no itinerary, on my way to Spain. Then I discovered the south of France and refused to go farther. I didn't speak a word of French, but somehow managed to get along, using sign language, Spanish, and avoiding eye contact. A short visit turned into a 1 month, then three months, then six. Finally, I had to admit it: I was living in France. I had survived in France for six months, avoiding French. It was time to take the plunge. I checked myself into a French school for two days and three nights. 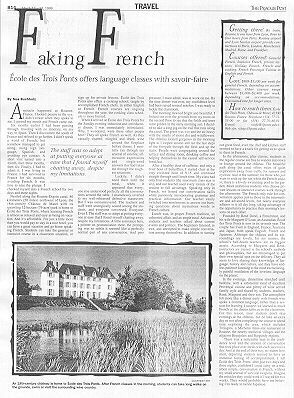 Nestled along the Roanne-Digoin canal, 80 kilometers (50 miles) northwest of Lyon, the 18th-century Château de Matel with its sprawling 32-hectare (79-acre) park is home to L'école des Trois Ponts, where learning French is almost as relaxed and easy as being on vacation. And it's adorable. For just a little more than you would pay to stay in a nice hotel, you can have a great vacation and go home speaking French. Students can take the general or intensive course in a classroom situation, or sign up for private lessons.L'école des Trois Ponts also offers a cooking school, taught by accomplished French chefs, in either English or French. French courses are ongoing throughout the year; the cooking class schedule is more limited. When I arrived at L'école des Trois Ponts for the Sunday evening induction and introductory dinner, I was immediately intimidated. Why, I wondered, were these other people here? They all spoke French so well. As they casually chatted, mingled and drank wine around the fireplace belore dinner, I mentally ran through my arsenal of surefire, all-occasion expressions and single-word answers that had taken me through the toughest situations. Luckily, I didn't need them until the meal, when it appeared that everyone else understood perfectly all the conversations around the table. I shamelessly reverted to my well-rehearsed defensive maneuvers. But I was outmaneuvered. The teachers and staff were strategically seated among the students, and everyone conversed. Everyone. Even I. The staff was so adept at putting everyone at ease that I found myself chatting away, despite my limitations. A little assistance here, a pointer on prononciation there, the prompting was so subtle it seemed like a perfectly normal part of any conversation. And peer pressure, I must admit, was at work on me. By the time dinner was over, my confidence level had been raised several notches. I was ready to tackle the classroom. The moming dawned bright and beautiful. I looked out over the grounds from my room on the second floor to see that the fields and trees were golden in the early morning sun. I decided to take a long jog on the trail that runs along the canal. The grass was wet and the air heavy with the smells of moist dirt and wildflowers. The château looked gorgeous in the morning light as I looped around and ran the last steps of the footpath through the field and up the stairs. People were congregating around the terrace and dining room, drinking coffee and helping themselves to the casual self-service breakfast. After a healthy dose of caffeine, and only a brief bout of butterflies, I started class at the very civilized hour of 9:15 and continued straight through until lunch time. My class had only four students (the maximum class size is six), and out teacher used every minute of the session to full advantage. Speaking only in French, we honed out conversation skills while painlessly incorporating grammar and practical information. Our teacher easily switched into minilessons to answer out burning questions about mysterious words or French culture.
. In the afternoons, after classes, students in the regular course are free to wander into town or lounge around the château. The beautiful path along the canal offers miles of quiet exploration away from traffic for runners and cyclists. And in the summer, for those who just want to soak up the sun while the French soaks in, there is a lovely swimming pool in the garden. More ambitious students who choose private lessons or intensive courses work through the aftemoons. The French-only rule for conversation applies just to those in the intermediate and advanced levels, but nearly everyone adheres to it all day long, taking advantage of the opportunity to practice their morning's lessons on each other. Founded by René Dorel, a Frenchman, and Margaret O'Loan, an Australian, L'école des Trois Ponts is now in its seventh year. Although the château and its surroundings are lovely, for my money, the school's half-dozen teachers are its biggest assets. According to Margaret and René, instructors are trained in the school's methods and philosophies, but are encouraged to put their own special spin on the delivery. They all seem to love sharing their knowledge of language, history and culture, and they have endless patience listening to the most excruciatingly painful mutilation of the loveliest language on the planet. In the evenings, dinnertime stretched until bedtime, with a substantial meal of excellent Provençal cuisine and plenty of wine served family style and shared by students, teachers, René, Margaret and their son. The atmosphere felt more like a dinner party with friends who spoke a common language, rather than a session for learning. I suspect we learned as much French at the dinner table as in the classroom. For this reason, most students don't skip evenings at the château, but do take an extra day or two after completing the course to spend time exploring the area, which include: Troisgros, a Michelin three star restaurant in Roanne, the nearby medieval villages and the adjacent Beaujolais and Burgundy regions. There was a noticeable leap in the confidence level and the amount of conversation that took place over meals with each successive day. And at the end of their stay, no matter how short, departing students seemed to have an immense feeling of accomplishment. I left L'école des Trois Ponts, after just two days and three nights, confident I could carry on a real, albeit simple, conversation in French, without my small arsenal of survival weapons. Imagine the miracles they could work if I stayed for two weeks. They would probably have me believing I'm ready to tackle Japanese.